This Overnight Baked French Toast Casserole is always a complete hit! It’s vegan, takes 15 minutes of prep and each bite is loaded with deliciousness! It’s the most wonderful time of the year! Okay, cheese ball much? Seriously though, Christmas time is my absolute most favourite time of the year. The decorations, the music, the energy, the music…AND of course, the delightful food. Take french toast for example. Every December, I feel an immediate pining for it. 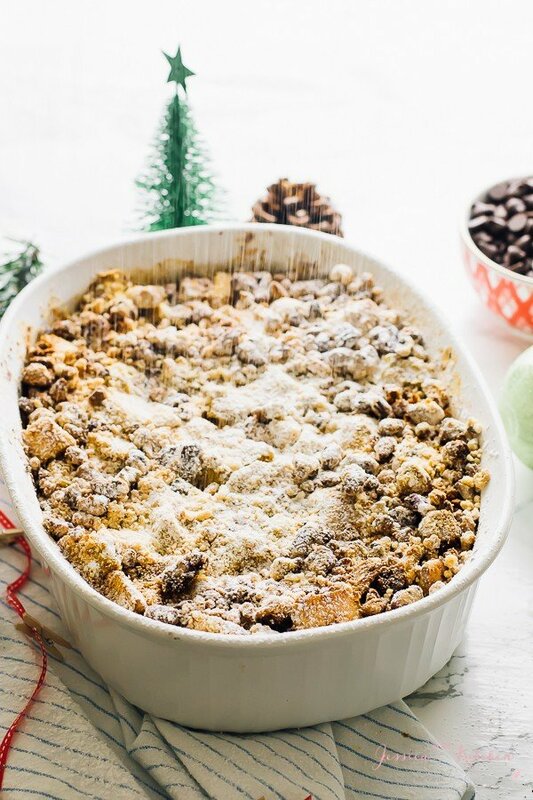 This Overnight Baked French Toast Casserole hit every single craving right out of the park for me. 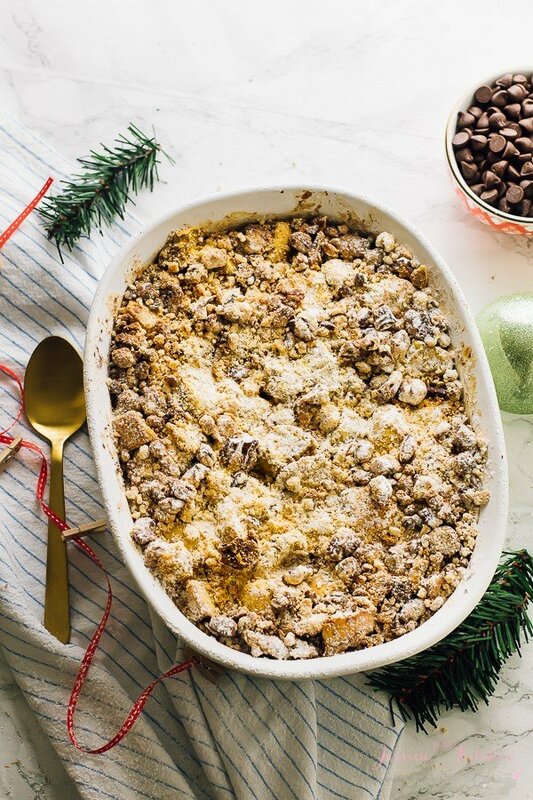 Comforting, insanely festive, loaded with delicious cinnamon-y flavour and SO easy to make. I know just how hectic the holidays are, so I’m going to make this one extra easy for you. I actually just bought my tree yesterday and my brain is 100% decorations this, decorations that. With that, gift shopping, my holiday cleanup and family time, no wonder it’s so busy! Luckily, the prep steps for the french toast casserole are incredibly simple. If you want to bake yourself a loaf, that’s perfectly fine. I purchased a baguette from the French bakery down the road from me. This made everything way easier. The next steps are mixing the vegan batter for the french toast casserole, pouring it over the bread, and letting it set overnight. YES, easy peasy. You could make this right after dinner, or right before bed and just leave it in the fridge. Which is exactly what I did. The magical elves then jump in (can’t help myself) and the loaf soaks up all of the cinnamon-y goodness of the batter. You honestly don’t even need the topping at this point. It IS however, absolutely the cherry on top. The next morning, whip up the maple pecan topping for the casserole. Mix and stir, as the video indicates. Simple. Spread over and bake. You don’t need to top it with insane amounts of organic powdered sugar. That’s a crazy video food blogger thing. You definitely do need to drizzle some maple syrup or agave nectar all over it though. Taste a bit first, because mine tasted lovely with out. The maple syrup was just to bring in that holiday cheer of sitting around the table, eating french toast casserole and watching Elf for the 12th time. P.S. This freezes perfectly. So if you’d be so kind, I need to cut another slice and devour this to the smell of Christmas wafting through my house in every way possible. Set the french loaf in a casserole dish (I used a 1.5 QT). Mix together the pumpkin puree, flax eggs, coconut milk, almond milk, maple syrup, ground cinnamon, salt and vanilla extract. Mix thoroughly. Pour over the bread and press down so every bit gets soaked in batter. Cover with saran wrap and place in the fridge overnight, or at least 6 hours. Remove from fridge when set. Preheat oven to 350 degrees. In a small bowl, mix the almond flour, maple syrup, vegan butter and chopped pecans. Stir together to combine and spread over the top of the casserole. Bake for 45 to 60 minutes. I prefer about 50 which is set but still soft on the inside. If you want it completely baked, definitely aim for 60 minutes. The top may get a bit crispy after the first 20 minutes so cover with foil if necessary and keep baking. Remove from oven and allow to cool slightly. Serve with maple syrup and enjoy! TO MAKE IT GLUTEN FREE Use a gluten free loaf. ALTERNATIVES You can sub any other liquid sweetener such as agave. You can put in more add-ins: blueberries, more spices, apples. You can use coconut flour instead of almond flour, or regular flour if you aren’t gluten free. 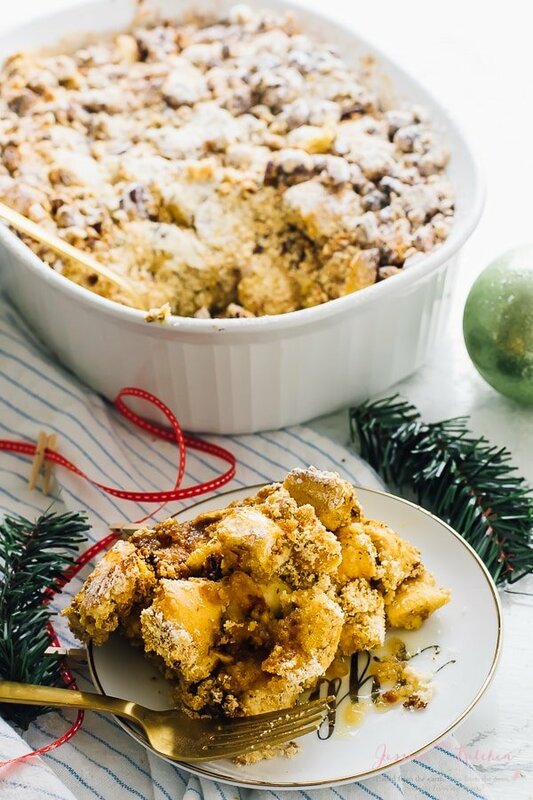 If you try this Overnight Baked French Toast Casserole (Vegan) please let me know in the comment section below, or tag me on instagram with the hashtag #jessicainthekitchen! For more exclusive recipes follow me on Instagram AND on Snapchat: jessinkitchen. This would be a great breakfast to wake up to! Have you tried cutting this up and freezing it? I’m often cooking for just me so when I make large dishes like this, I have to freeze it.. This looks fantastic & I’d love to try it! Yes I have! I’m actually eating it piece by piece from the freezer now haha. You just cut it up like a casserole, wrap it in foil then in a plastic zipped bag. Then just reheat it at about 450 degrees Fahrenheit for about 15 to 20 minutes (that’s what I did) to reheat it. It’s a bit iffy re time depending on the size. Does the loaf need to be dried out at all if it is a little soft for a french loaf? So excited to try tonight! The serving size says this serves 1. Is that correct? Oh dear, no!! I just made a few changes on my site and it seems it filled it all the blank serving sizes with “1”. Thanks for pointing that out – this serves at least 7 people well! This looks delicious! Making for Mother’s Day 🙂 When you say coconut milk, is that full fat canned coconut milk? Or the kind in a carton? Thanks! Sorry I’m just seeing this!! Either is fine, full fat if you want it richer! Pumpkin Puree? Does it taste like pumpkin? Hi, Jessica! 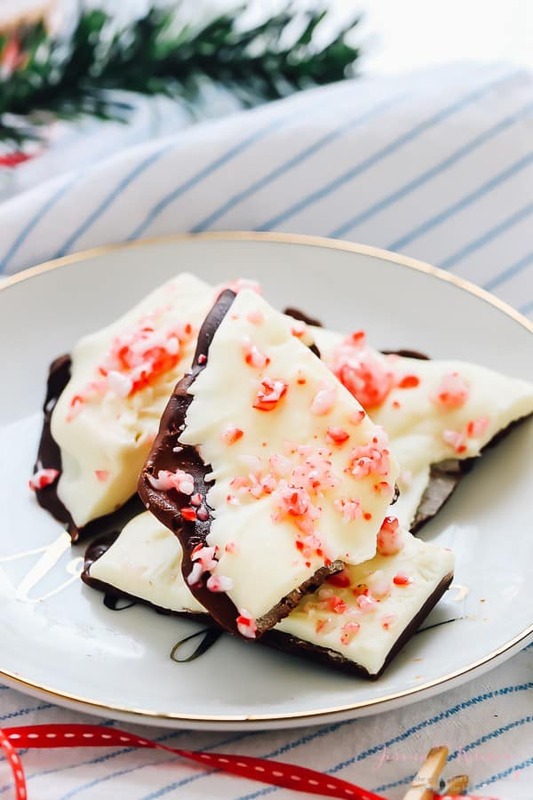 I love this recipe and am making it this weekend for a Christmas brunch. My oven is broken and I have to use a family members, so I need to get creative-what do you think the longest this can sit in the fridge prior to baking is? Thanks! Sorry I’m just seeing your comment!! I think overnight is probably the longest time you’d want to have this! Have you tried using VeganEgg (Follow Your Heart brand) instead of flax eggs? I like it for the more eggie texture. If I use it, do you think I should liquids or anything? 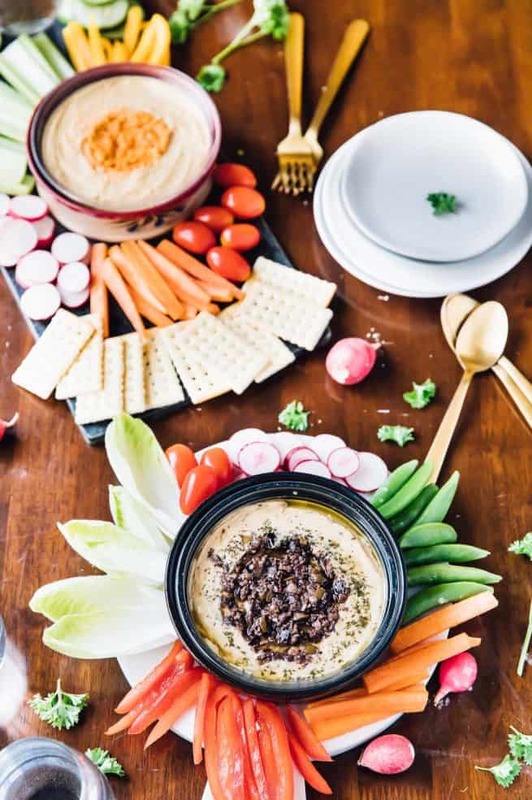 Can’t wait to try this for a potluck brunch I’m going to this weekend! I haven’t tried it in this!! Sorry I’m just seeing your comment – I hope it went well! I made this last Christmas and it was delicious. But I don’t remember what size can of pumpkin purée I used. The recipe doesn’t specify. What do you recommend? I would love to make this. However, I have family members that are allergic to coconut. Do you have a suggestion of what I could use instead? You can use cashew milk! I hope that helps! Thanks Jessica, Yes it does! What a great recipe. Guests coming for brunch next week are vegan, gluten free and allergic to soy and almonds. Can all the liquid be coconut milk rather than two types of milk? Any adjustments for that? Thankyou. Thanks so much Vicki! Yes you should be able to do just one milk! I hope that helps and that you all enjoy!! I made this yesterday but I modified it a bit. I subbed sweet potatoes for the pumpkin (I have pumpkin burn out after Thanksgiving, ha!) and cashew milk for the coconut milk. I have to say this was delicious! I know this will be a hit during Christmas brunch, and I have a feeling I’ll be getting requests for this all winter. Thank you for this great, EASY dish! Haha the the subs that you made sound good. I’m glad it worked out! I hope your Christmas brunch goes well! 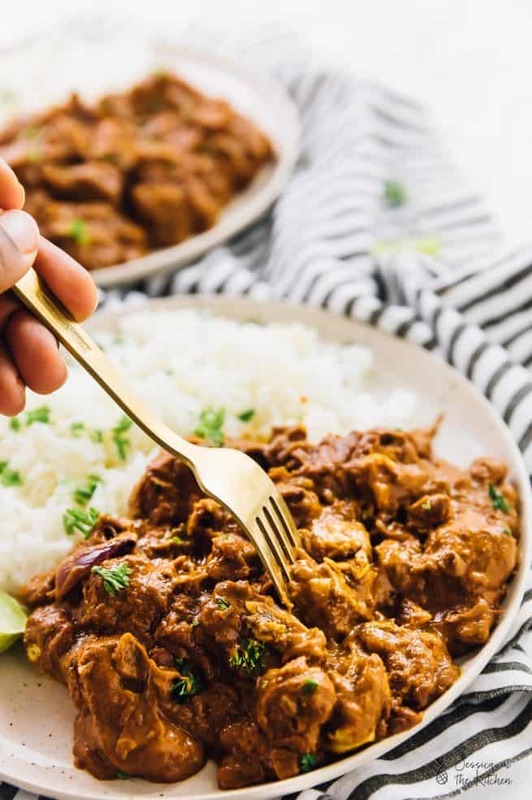 Thank you for trying our recipe, we’re glad you found it to be delicious and easy! Hi! How much is 14 ounce in cups? Hi Sonya 1 3/4 cups! I hope this helps. 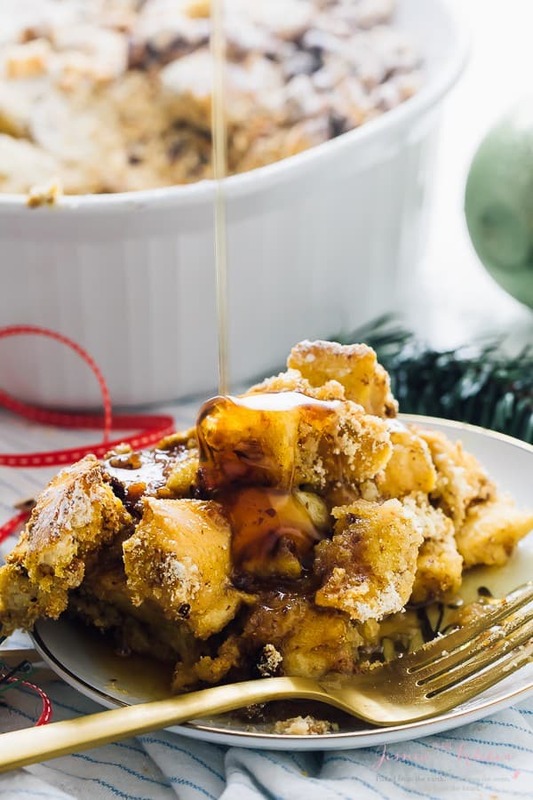 When I arrived home for the Christmas holiday, my mama gave me an unexpected challenge, she wanted me to make a baked apple french toast casserole for Christmas breakfast. I had done this a few years ago but now I needed to find a plant-based version. Luckily, I already had this recipe pinned! I made a few changes, subbed the pumpkin puree for sliced apples and I used cashew milk instead of coconut. I also decided to double the topping so everything could get covered. It was a huge hit and everyone (omnivores too) loved it!! My mama actually said this would now be part of our Christmas tradition! Thanks for sharing such a great recipe!! Wow Thank you so much! We’re glad that we could add something to your family! I prepped this last night and cooked it this morning, it was fantastic and my whole family liked it – even the non French toast eating. I added a touch more maple syrup and omitted the topping, and served with walnuts and strawberries on the side, so yummy! I used a 4 day old sourdough baguette which I had to cut it was so dry… I crossed my fingers and hoped for the best and wham! Delicious! Thank you for sharing! This is going to be my go to for busy/lazy mornings! I’m SO so happy to hear that!! Sounds like it really worked for the entire family. Thanks for sharing with us and I hope you continue to enjoy this! Also thanks for the reminder – I have a sourdough going dry and I should use this! Thank you so much for sharing with me! SO happy that you’re family enjoyed it so much, especially your day! You’re so very welcome! If my family can tolerate eggs and egg whites, how much should I use in place of flax eggs? Thank you! I’m not sure exactly since I haven’t tried it, but four eggs should work fine! I hope that helps! I made this and used all almond milk. It was very mushy. Do you know what I might have done to mess it up? Thank you! Hi Danielle thank you for trying our recipe, I’m so sorry to hear that! Lets see how I can help, based on your comment when you said all almond milk you substituted the coconut milk for almond milk. I’m assuming you made the flax egg and used pumpkin puree? Asking these questions so that I can get a better understanding.